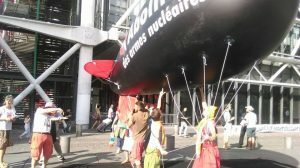 On August 8, about fifteen “clowns-in-reverse” demonstrated in front of the headquarters of La République En Marche, the new political party of French President Macron. “We came to thank him, because the war is a lot better than the Treaty!” said the Chief of Staff of the Clown Armies. Under a super-sized inflated bomb, the clowns celebrated “Jupiterian France” for opposing with all its might the introduction of the international treaty to ban nuclear weapons. They were soon joined by some fifty men in blue who forcibly expelled the clowns from the building and detained them, recording their identities before they were released. 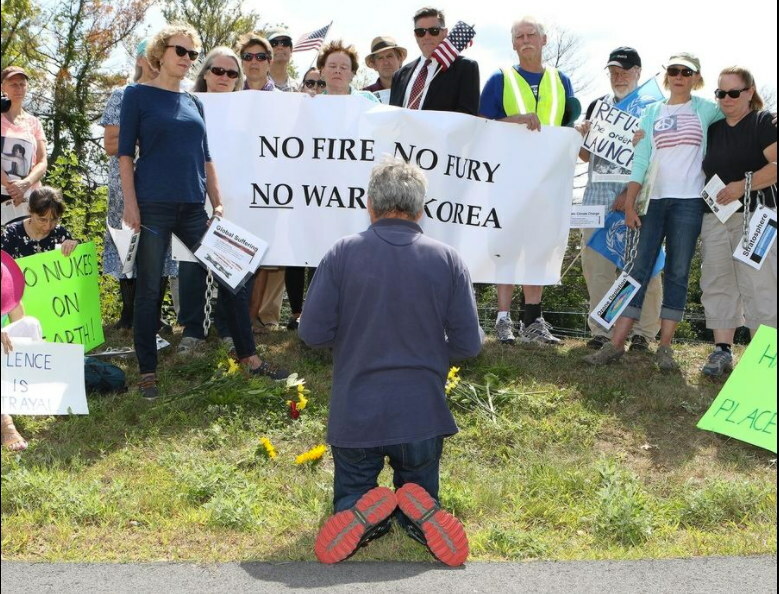 On Saturday, August 5, in anticipation of the anniversaries of the bombings of Hiroshima and Nagasaki (August 6-9, 1945), people were back in front of Lockheed Martin, the world’s largest war profiteer and the U.S. chief nuclear weapons contractor. 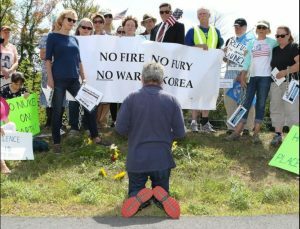 Members of the Brandywine Peace Community had a “meet-up” on the large grassy area in front of Lockheed Martin. Colorful banners and signs surrounded the extremely well-traveled corner. 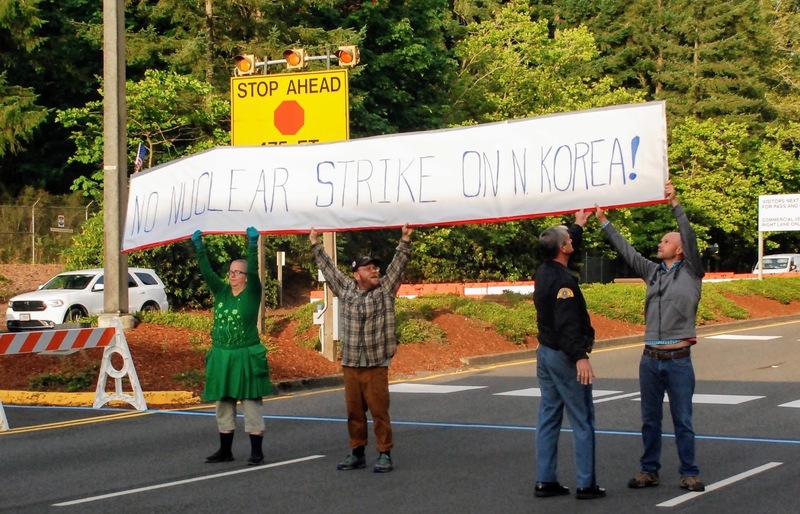 A few bold banners – Hiroshima! We Shall Not Repeat the Sin – hung from the wall leading up to Lockheed Martin’s main entrance. Activists blockaded the West Coast nuclear submarine base that would likely carry out a nuclear strike against the Democratic People’s Republic of Korea (North Korea) should President Donald Trump give the order. Naval Base Kitsap-Bangor, just 20 miles from Seattle, is home to the largest concentration of deployed nuclear weapons in the U.S. More than 1,300 nuclear warheads are deployed on Trident D-5 missiles on the eight ballistic missile submarines based at Bangor or stored at Strategic Weapons Facility Pacific (SWFPAC) at the Bangor base. 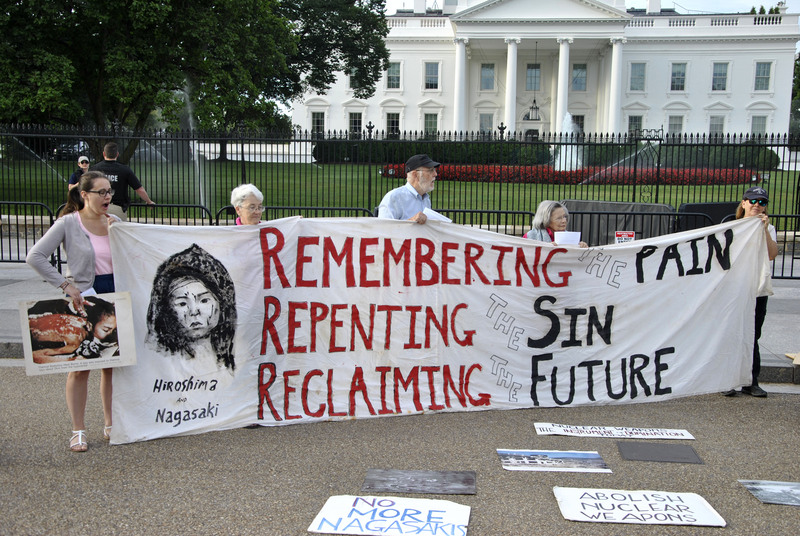 On August 9 from 12:30-1:30 p.m., about 30 people from the faith-based peace community in D.C., Virginia and Maryland, held a witness of repentance at the Pentagon to commemorate the 72nd anniversary of the U.S. nuclear bombing of Nagasaki. Displaying a lead sign saying “U.S. 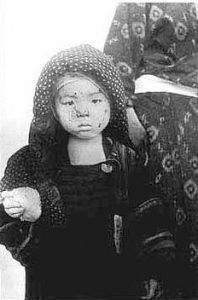 Nuclear Bombing of Nagasaki, August, 9, 1945 – Repent,” and carrying other disarmament signs and photos of the carnage and victims of the atomic bombings, we processed from Army-Navy Drive to the police designated protest zone, which is located in an enclosed space with a bicycle fence on the southeast corner of the Pentagon near the south parking lot. Once at the site, we encountered numerous Pentagon police and security as well as some Pentagon workers. 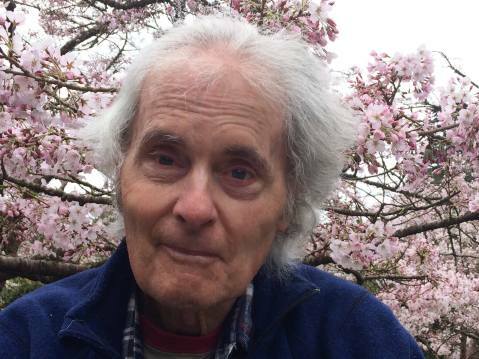 Bill Frankel-Streit and Eric Martin proceeded past the protest zone and were told by police that they could not continue further or remain on the sidewalk. When they refused to comply with an order to go into the designated protest area after several warnings they were placed under arrest. The August 9 “March for Nuclear Abolition & Global Survival” to Livermore Lab was at once moving, solemn, joyous, powerful and timely – with the opportunity to address the U.S. atom bomb attacks on Hiroshima and Nagasaki in the context of Trump’s threat to unleash “fire and fury” on North Korea. 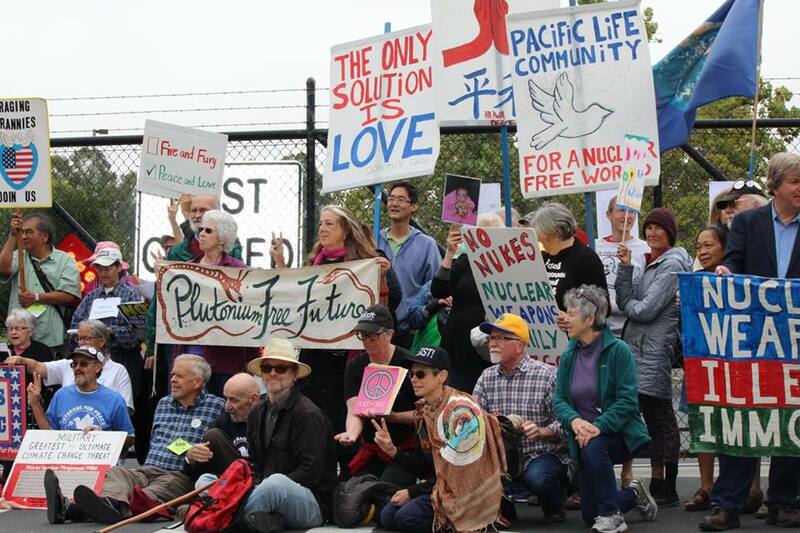 One element of our August 9 program was the delivery to Livermore Lab of the “Treaty on the Prohibition of Nuclear Weapons” adopted July 7 at the United Nations by a vote of 122-1-1. Since the Lab director declined to accept it in person, the pages were strung across the West Gate, where peace advocates would soon risk arrest. There were about 250 people at the rally and 48 were peaceably arrested after a die-in in the road. 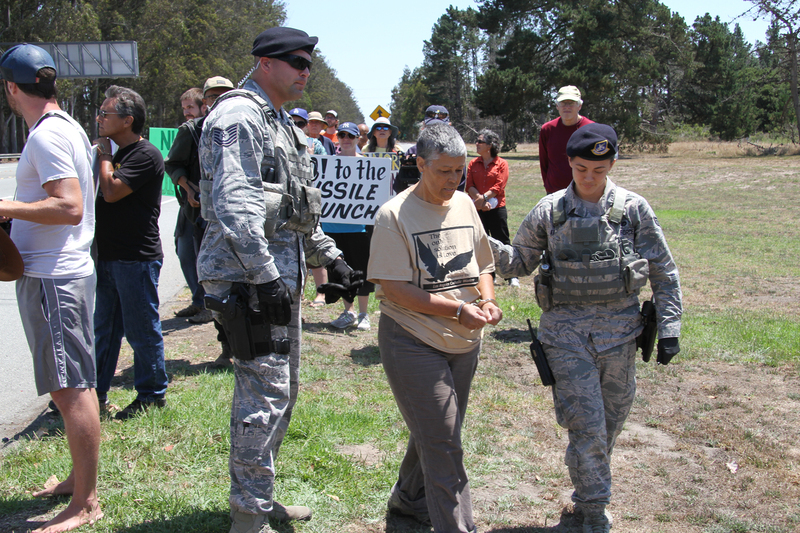 On Saturday, August 5, the Los Angeles Catholic Worker joined the Guadalupe Catholic Worker and others in a prayerful witness at Vandenberg Air Force Base commemorating the 72nd anniversary of the U.S. atomic bombing of Hiroshima and Nagasaki, and calling for the elimination of ICBM missile testing, nuclear weapons, and U.S. imperial war-making. 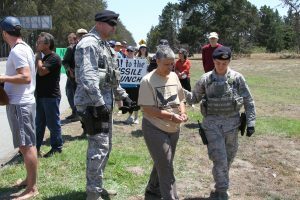 Three Los Angeles Catholic Workers – Jeff Dietrich, Mike Wisniewski, and Karan Benton – were faced with arrest for “ban and bar” violations if they did not immediately leave the protest area. (They had each received ban and bar letters after previous arrests at the base.) Jeff and Mike chose to leave rather than face arrest, while Karan refused to leave. She was immediately arrested, cited for trespass and later released facing a future court date and certain jail time.